The Bluetooth Keyboard securely holds in place the iPad using a patent pending retention clamp to allow nearly 180 degree positioning for the perfect viewing angle. Just slide in the iPad until it clicks, and pull to remove it. 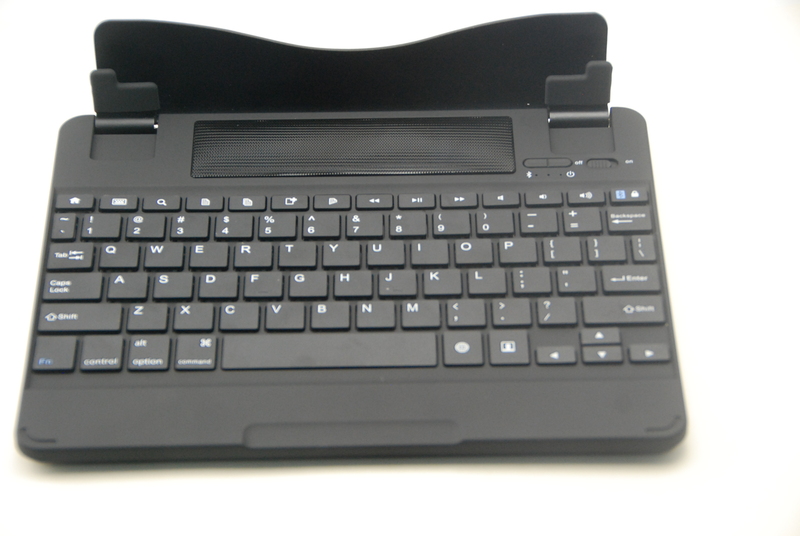 The keyboard has a 6000mah rechargeable lithium-ion battery that can be used to charge the iPad. It comes with a clear poly carbonate cover case for added protection while in use with an iPad2 and iPad3. The keyboard uses scissor-switch keys for greater ease and comfort of typing and hot key correspondent to iPad functions. The built-in Bluetooth stereo speaker can paired with the iPad or other Bluetooth enabled audio devices for improved listening experience. The keyboard can function up to 30 feet away from a paired device. It is able to wake and sent your iPad to sleep and the keyboard automatically shuts off when not in use.